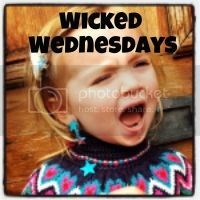 This weeks Wicked Wednesdays photo is captioned “Look but don’t touch”. H is more than happy to “show” D his favourite programmes on the iPad but I’m not sure he’s quite ready for her to start swiping or changing channels just buy augmentin canada yet…. Better get ready H as it’s only going to get worse…. Love the cover Kate, its saved the iPad’s bacon a few times, once from the top of the stairs when H was in his terrible two’s stage. Its only an iPad 2 but I don’t think it would have lasted this long if it wasn’t in that case. As for D and H, I’m sure this occurrence is only going to get worse as she finds her feet…. hahaha! Love it….What a great photo! Yes it’s the same in our house. I think it’s going to be Bedlum once the smalls realise the power they have (& what they can do!). Mine would have been having a bundle by this point, well done, your two seem a bit better behaved. Isn’t it crazy how quick they pick them up though Maria?!?! H really know’s his way around them and I have no doubt D will soon too if she wants to know how to use it properly… even for H’s sake. I’d like to hope that if he had to choose between them both he’d pick D…. how long that goes on for if she keeps trying to get her hands on his stuff is anyones guess!